My grandma used to make this very often. I love to eat this with a dallop of sweet creamed butter. 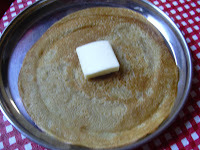 Here is the recipe for jaggery dosa. We need to make wheat flour in the form of dosa batter. For that we need one to one and half cup of water. Take required amount of water and heat it. Make it a luke warm water. Put the jaggery in it and let it melt in it. The normal water now will become jaggery water. Now add wheat flour gradually and whisk it till it becomes moistened. The batter should be in dosa batter consistency. Now add the ghee and cardamom powder and keep it aside for 10 mts. 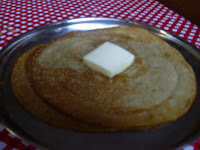 Now pre heat a skillet, spread 1/4 tsp of ghee in it and pour a laddlefull of batter and spread it into a circle. Pour 1/4 tsp of ghee around the edges and let it cook under low flame. Flip on the other side and again pour ghee (optional). Cook it till its fully done. Do not burn the dosai. Jaggery can burn easily. So try to cook it in low flame. I like to eat this dosa hot with a dallop of butter.